Varnish Remover Poisoning is the accidental or intentional intake of the compound. The intake may be through swallowing the liquid or inhaling vapors of such compounds. What is Varnish Remover Poisoning? What are the Causes of Varnish Remover Poisoning? What are the Signs and Symptoms of Varnish Remover Poisoning? The signs and symptoms of Varnish Remover Poisoning can vary from one individual to another. It may be mild in some and severe in others. Several systems of the body, such as the digestive system, respiratory system, vascular system, urinary system, skin and ENT may be affected. How is First Aid administered for Varnish Remover Poisoning? Who should administer First Aid for Varnish Remover Poisoning? 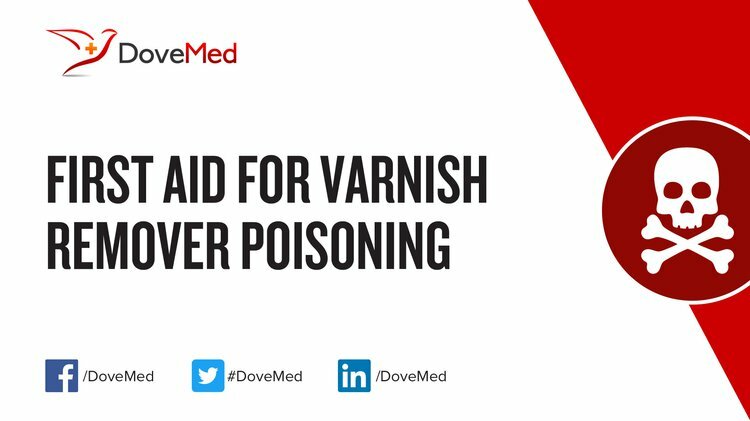 First aid for Varnish Remover Poisoning is administered by healthcare professionals. What is the Prognosis of Varnish Remover Poisoning? How can Varnish Remover Poisoning be Prevented? Liu, J. J., Daya, M. R., & Mann, N. C. (1999). Methanol-related deaths in Ontario. Journal of Toxicology: Clinical Toxicology, 37(1), 69-73. Senthilkumaran, S., Balamurgan, N., Menezes, R., & Thirumalaikolundusubramanian, P. (2012). Nail polish remover poisoning: What caused methemoglobinemia?. Indian journal of occupational and environmental medicine, 16(2), 91. Minns, A. B., McIlvoy, A., Clark, A., Clark, R. F., & Cantrell, F. L. (2013). Examining the risk of methanol poisoning from methyl acetate–containing products. The American journal of emergency medicine, 31(6), 964-966. Churi, S. H. O. B. H. A., Harsha, C., & Ramesh, M. (2012). Patterns of poison information queries received by a newly established south Indian poison information center. Asian J Pharm Clin Res, 5(Suppl 2), 79-82. Khadka, S. B. (2005). A study of poisoning cases in emergency Kathmandu Medical College Teaching Hospital. Han, H. (2010). Acute 1, 2, 3‐Trichloropane Poisoning: A Case Report and Literature Review. Basic & clinical pharmacology & toxicology, 107(6), 988-990. Brown, V. (2012). Household Products. Textbook of Clinical Pediatrics, 2609-2620. Trummel, J., Ford, M., & Austin, P. (1996). Ingestion of an unknown alcohol. Annals of emergency medicine, 27(3), 368-374.